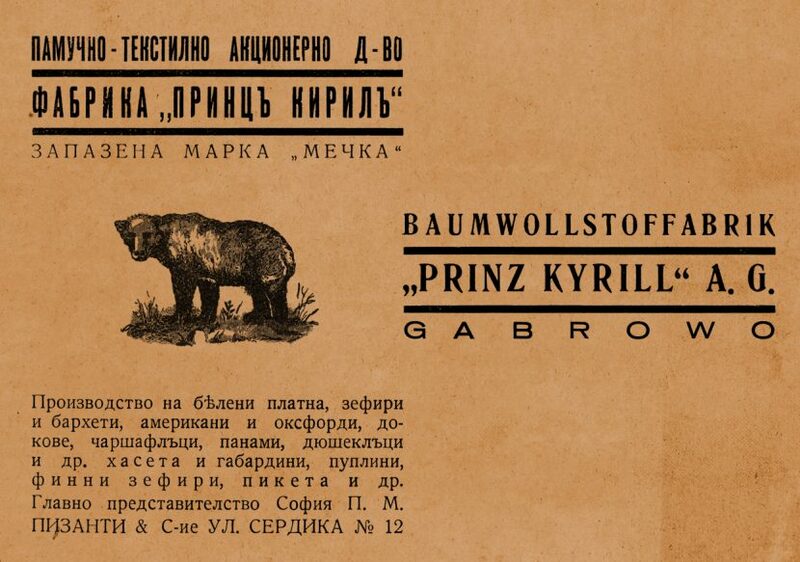 Founder of the cotton-fabrics industry in Gabrovo is considered the group of traders and industrialists, who had raised the first cotton-fabrics joint stock company “Prince Cyril” on February 6th.,1912. First shareholders and founders of this cotton-weaving workshop are St. Chitakov, D. Boynovski, Georgievi Brothers, Christo and Ivan Bulgarievi and Iliya Poundev. The factory, built by them is a small, stone, one-storey building in Borovoto district. Only imported yarns and Oxford, as well as white-washed cotton-fabrics had been used. Despite the efforts of the Management Council for development of the company, its entire activity had been unsuccessful and in most cases had been concluded at a loss. No improvement had been achieved although the often changes among the managing staff. In October 1919 D. Rousev had been elected a chairman of the company. Renovated management staff had not achieved anything valuable for stabilization of the factory. This had been a time of destruction, heavy economic and political crises, as a result of which on June 11th.,1920 the company members had decided to cease its activity by selling a small factory to Hadzhidechevi Brothers from Varna, who had been the owners of “Textiles” factory in the city. After buying all company shares, before mentioned persons had expanded the main capital to the extent of 24 millions and in a short time period they had enlarged the factory. Beginning of 1930 the cotton-fabrics company had become an ownership of the newly established joint stock company with Jewish shareholders from Milan. During the war period and with respect to the law restrictions against citizens of Jewish origin, as well as, in conformity with the law for defence of the country, the state had mingled with the work of the company, shares of Pizzanti had become a state property. End of 1944 the main Jewish shareholders had taken the ownership of the company. They had taken into consideration the new political and economic changes and in 1945 had renamed “Prince Cyril” Ltd. into “Cotton Fabrics”, with headquarters and agency in Sofia. By the Nationalization the factory had been a modern European company with a famous production.